We deliver and build small sewage treatment plants as complete modules in high-quality PE tanks produced in rotational moulding or, for bigger plants, also in welded plastic tanks or sea containers. Furthermore, for existing tanks on site, we deliver complete retrofitting sets (kits) – pre-assembled in the factory – for sewage treatment plants. 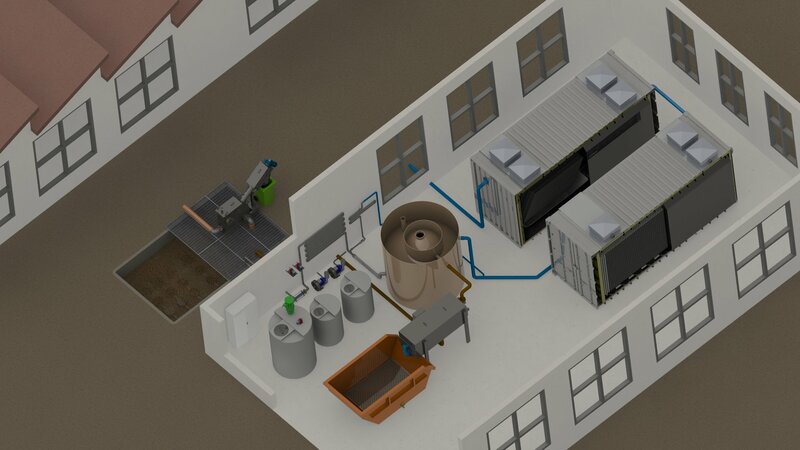 ClearFox® sewage treatment plants as modular system – simply clever! Many commercial developments are located in areas where there is no main public sewer available. In these instances, commercial off mains drainage solutions are required. In the past, commercial off mains drainage options were very limited in their scope. Septic tanks were often used. Septic tanks however, have a very limited treatment efficiency, as low as 20%. Poor quality effluent can result in pollution of groundwater and surface waters. Also, the poor suspended solid removal rates can cause soakaways and percolation areas to fail. An alternative method for commercial sewage and wastewater management was in the form of a cesspit or a cesspool. These wastewater storage tanks are designed to hold wastewater and sewage. They are them emptied intermittently by a licensed waste collection company using a vacuum tanker. While cesspits are effective, the regular desludging and emptying is very expensive and unsustainable. Commercial developments such as hotels, residential homes, worker camps, construction sites, leisure centres, caravan parks, nursing homes, asylum-seekers’ hostels and schools now install commercial sewage treatment plants to deal with the sewage generated onsite. A number of different treatment processes are available, including activated sludge systems, SAF systems [submerged aerated filter], MBBR [moving bed biological reactor] and SBR systems [sequential batch reactor]. RBC [rotating biological contactor] is also an option, but they are less favoured due to the high maintenance and operational costs. Commercial sewage treatment plants are available for both above and below ground applications. Systems are offered in reinforced precast concrete tanks, GRP tanks and plastic tanks. With most commercial sewage treatment plants, it is important to have a grease trap installed to remove fats, oils and grease from the sewage and wastewater, as this can have a negative impact on the treatment process. Clearfox commercial sewage treatment plants can be installed to achieve any level of effluent required. Our systems are reliable, robust, and they have the lowest energy and maintenance costs on the market. Depending on the requirements and wastewater type, combinations of different processes may be required. We offer all the necessary services, including the first pilot plant, project planning and ready-to-use sewage treatment plant. We offer chemical, physical and biological wastewater treatment plants in compact design. Our core competency is the food and beverage industry with wastewaters which are organically highly polluted. By using high quality components, we guarantee continual and trouble-free operation. Due to an integrated energy saving mode, our sewage treatment plants adapt to the actual sewage volume and save energy. Due to its simple structure and the used biofilm technology, the plant is well suited for decentralised operation. The main features are a very stable operation (underload, overload) and enormous cost savings in the long run, due to fewer technical parts and low disposal costs.